In just two weeks, light sport aircraft (LSA) will descend upon the Sebring Regional Airport (KSEF) for a weekend of aviation festivities. 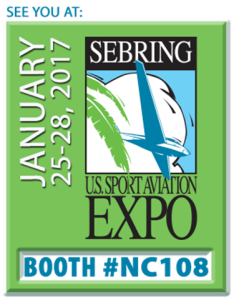 The 13th annual expo, taking place January 25th through 28th highlights the latest and greatest in the light sport aircraft industry. From forums to workshops and demonstrations, Sebring is the place to be for LSA owners and enthusiasts. The agents and pilots at Aviation Insurance Resources (AIR) will be returning once again to the Sebring Expo. Light sport aircraft have a special place at AIR as the agency was one of the firsts to tackle insuring this category of aircraft when it was developed. Stop by booth NC108 to speak with Gregg Ellsworth and Joe Cacho about your light sport aircraft. Can’t make it to the show? Request your quote online or call 877-247-7767 today! PreviousPrevious post:What you need to know about the new FAA medical rule and your aircraft insuranceNextNext post:Aviation Business Owners: Yes, you do need to carry Workers’ Compensation!